We all have our favorite blogs..places we love to check in on and I'm no exception. One of mine is Forever Daisies. Her and her husband are getting ready to move and in the process are sorting out trash from treasures. She recently sorted out her junk drawer and posted pictures. Then, she challenged all of us to post pictures of our junk spaces. 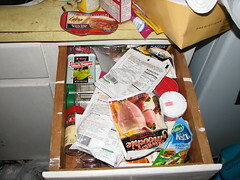 Well, my entire place feels like a junk bin right now, but I decided to go with my "spice drawer." As you can see below, it's too small to hold any realistic amount of spices so it somehow became the toss every packet, etc into drawer. Since I'll be moving in May, this one will be getting sorted soon! In fact, I might go do that after I post this and show all of you an after shot! I look forward to seeing the transformation!